Didem completed her middle school education at Kultur Private Middle School and her high school education at Kultur Science Academy. She graduated from Istanbul University's Physical Therapy and Rehabilitation program in 2002 and received her Bachelor of Science degreee. That year she moved to New York, United States in order to complete her master's degree in Speech Language Pathology and Audiology. She graduated from New York University in 2005 as a Speech-Language Pathologist, receiving her Master of Arts degree. Didem worked as a pediatric clinician at InterActive Therapy Group, which is a prestigious private practice in Manhattan providing services to children and their families, from 2005 to 2008. She provided home-based Early Intervention services for children aged 0-3 with speech-language disorders, language delay, autistic spectrum disorders and feeding problems in New York City. Didem also provided home-based and school-based assessment and therapy services for preschool age children, and worked with school aged children with communication difficulties at several Charter Schools in New York. She obtained her Certificate of Clinical Competence in Speech-Language Pathology (CCC-SLP) which is given by the American Speech Language Hearing Association (ASHA) in 2006. Some of the facilities that Didem completed her internships and externships at include: New York University Speech and Hearing Clinic, Public School 89, Special Citizens Futures Unlimited, Bellevue Hospital Center and New York University School of Medicine. She is a member of American Speech Language Hearing Association (ASHA). 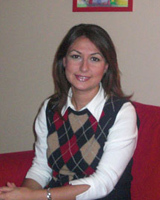 Didem returned to Turkey in the summer of 2008, and joined the interdisciplinary team of Gunisigi Child Center. She has been providing individual therapy and family training sessions, including Early Intervention services, and works with preschool and school age children with speech and language disorders. Didem implements DIR/Floortime approach in her sessions, especially when working with children with autistic spectrum disorders. She uses the PROMPT technique when working on articulation and eliciting the correct production of speech sounds. Speech and language disorders in children, articulation problems, speech/language delay, feeding problems, oral-motor insufficiencies. Assessment and early intervention for children who exhibit non-typical developmental patterns. Improving social language skills and functional communication by using DIR/Floortime approach, and family/school training for generalization of skills gained in therapy sessions. Teaching the correct production of speech sounds using the PROMPT technique.